Out-of-home advertising grew by 3.3 percent in Q1 2016, reports the Outdoor Advertising Association of America, and the category skyrockted to a spend of $7.3 billion in 2015. OOH is benefiting enormously from technology and helping to invigorate digital marketing. All kinds of ad campaigns can benefit from an OOH tie-in, but since this is the time of year when brands are cooking up back-to-school ads, here's a look at three out-of-home advertising tools you can use to ace your location-based back-to-school campaigns. At their best, billboards are the ultimate location-based ad format: A massive sign rooted in the ground, advocating your business. Plus, they've evolved with the techy times such that they now can be integrated into your mobile marketing campaigns. Consider this smart billboard campaign that Canon cooked up with the ad agency 360i. As Adweek reports, it consisted of pop-up digital billboards positioned around what Instagram showed to be some of New York's most photographed locations. The digital billboards gathered data from social networks, local traffic, and weather reports and used that data to advertise 200 location-based tips on how users could best photograph in those circumstances. Touting the hashtag #RealTimeTips, social media users were routed to CanonPhotoTips.com, where they could find dozens of photography tips. This campaign managed to make billboards a part of both mobile marketing and location-based marketing. According to Ad Age, the campaign was the first outdoor one that Canon had run in years, and as 360i's case study notes, it generated more than 27 million earned media impressions, with two million impressions generated through on-the-street engagement. Plus, Canon saw a 1,485 percent increase in brand engagement, and average weekly social shares for the brand rocketed by 31 percent. With traditional billboards, marketers are limited in measuring ROI, but with digital billboards that tie into mobile marketing, you have a concrete way of measuring its impact. One of the best ways to measure ROI for a billboard campaign is by designating a hashtag, as Canon did, to enable you to track the usage on social media. Out-of-Home advertising continues to grow with the adoption of new technologies. Let's say your brand sells backpacks—why not offer one free backpack for every 500th tweet or post using your hashtag? This will spread awareness and incentivize visiting your store. You could loop in a digital billboard to further promote the hashtag and to update how many backpacks you've given away. FedEx/Kinko's has a fun history of turning everyday urban objects into works of advertising art. In 2005, as Advertolog reports, the company installed what looked like giant containers of white-out on various street corners in NYC. On the massive containers' labels was a message noting that office products were now for sale at FedEx/Kinko's. The sculptures managed to capture attention and promote a new addition to the store. Crookedbrains shows how FedEx/Kinko's did it in again 2008, building fake shipping boxes around parking meters. Consumers love when you challenge them creatively and change up their everyday space. You only have a few weeks to excite people about back-to-school. You could take this in a number of directions, but bear in mind (especially if you're a small business), that an installation should appear within walking distance from your locale and be designated around some kind blowout sale to further incentivize walk-ins. However, it's hard to measure the ROI on an installation—unless, of course, you incorporate a QR code. Now that mobile is such a big part of the average consumer's life, you may want to integrate a mobile marketing component into your OOH campaign by implementing a QR code. 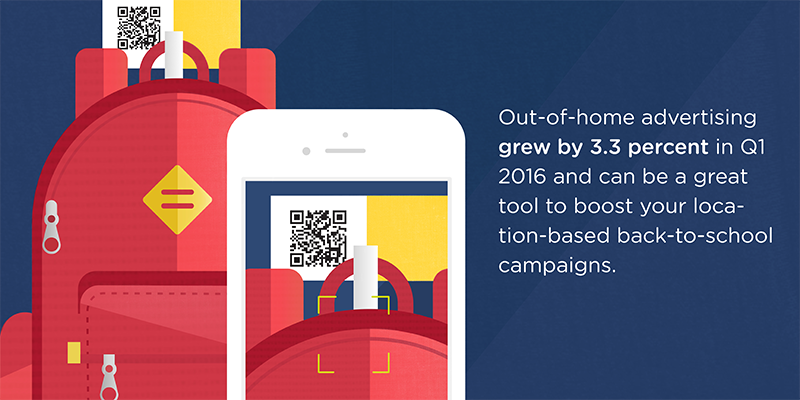 A QR code is like a barcode, but as SmallBizTrends points out, it can store up to 100 times more information. A local business may want to use it to boost interest in a particular product. As Innovative Retail Technologies reports, during last year's back-to-school season, WallFlower Jeans put QR codes on their brand tags so that when users scanned them in stores, a video with details on the fit and advice on styling would pop up. You could tag your outdoor installation with a QR code containing a coupon, or use them in-store to encourage shoppers to go on a scavenger hunt to earn discounts, apps, or games. Engagement becomes that much more powerful when your target consumer is out and about. 1. Take your mobile marketing to the next level with a digital billboard that can leverage real-time data and local factors. 2. Change up consumers' outdoor or in-store space with innovative display merchandise. 3. Enable consumers to learn more about and interact with a product before buying it by plugging in a QR code.